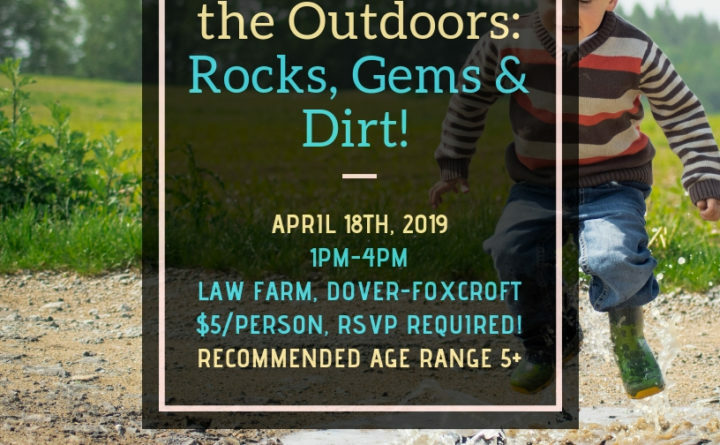 DOVER-FOXCROFT — Piscataquis County Soil and Water Conservation District has opened registration for the second session in its popular Families in the Outdoors series, Rocks, Gems & Dirt! to be held 1-4 p.m. Thursday, April 18, at the Law Farm in Dover-Foxcroft. Sessions are held outside. For the Rocks, Gems & Dirt! event, we will be exploring spring in all its muddy glory. Join us to hear from Fred of Northern Maine Minerals in Greenville, who will bring all kinds of interesting rocks, crystals and fossils to check out, will talk about the tools used to find these neat specimens, how to find special rocks in your backyard and lead us in a fun fossil-finding activity. Piscataquis County Soil and Water Conservation District will have you looking at dirt in a whole new way — teaching that soil is life, has several textures and colors and so much more. We will even dabble in some soil painting — who knew? The Families in the Outdoors program was started in 2018 from a grant received by the Davis Conservation Foundation. The goal of this program is to engage with families outdoors and provide fun, educational opportunities to learn and play together. In 2018, we explored the world of trees, Maine wildlife and learned to navigate the woods. We started out our 2019 program with a guided snowshoe at the Law Farm where we found snowshoe hare, coyote, deer and even lynx tracks in the snow! We encourage everyone to join us for this great program. Bring your kids, grandchildren or even a family friend and enjoy the great outdoors with us. This program is recommended for adults and children ages 5+. To join us, you must register by contacting the PCSWCD at 207-564-2321 ext. 3, info@piscataquisswcd.org, or on our website at www.piscataquisswcd.org. Information about Families in the Outdoors and registration information can also be found on our Facebook page — www.facebook.com/www.piscataquisswcd.org. There is a small registration fee per person, which supports our conservation education programs.